We’re delighted to announce our sponsorship of Moorfields Eye Charity’s Eye to Eye event for a fourth year. The sponsorship is part of our commitment to support the charity and NHS services at Moorfields in the discovery, development and delivery of the best eye care. Hundreds of patients, staff, friends and family will take part in the challenge to walk from Moorfields Eye Hospital at City Road to the London Eye on Sunday 10 March to raise funds for Moorfields Eye Charity. Together they are aiming to raise over £150,000 to go towards researching and developing treatments for common eye diseases like age-related macular degeneration and glaucoma, as well as the very rarest eye conditions. Every year since it started, Moorfields Private staff have taken part in the challenge and raised thousands of pounds. 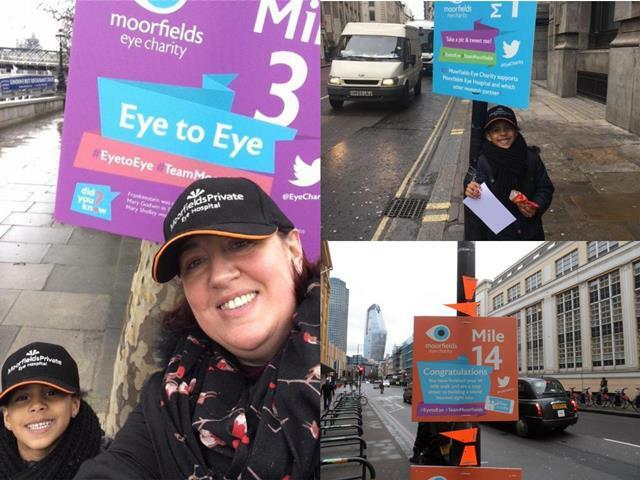 “We’re encouraging staff and patients to sign up for Eye to Eye this year and walk the brand new route to help raise vital funds for research,” said Barbara Wozniczka-Elenda, accounts officer at Moorfields Private. A recent paper by the NIHR Ophthalmology Specialty Group points to the need for greater financial support in the field of eye health. Despite more patients with eye problems being involved in research at Moorfields than ever before, eye disease research only receives one per cent of the research spend in the UK. Eye to Eye supporters have helped the charity make major investments in research over the past five years, which includes providing research grants to study a range of eye conditions. In March 2018, Moorfields and UCL made headlines around the world after two patients with severe age-related macular degeneration (AMD) regained enough vision to be able to read again. They were part of a research trial supported by over £5.5 million of funding from Moorfields Eye Charity, and co-led by Moorfields Private consultant eye surgeon, Professor Lyndon da Cruz. Registration for Eye to Eye is now open! Register your interest to join #TeamMoorfields and help fundraise to build a world beyond sight loss.